TRAVEL EATS- HOW TO SURVIVE A DAY IN THE AIR! A JUICY NAVAL ORANGE: Planes are dry, right? And oranges are juicy- the good ones anyway. Which means they’re hydrating. They’re also full of vitamin C, which is so helpful when you’re in a germ incubator for 6 hours! Most importantly- they taste so fresh and so sweet. Yum. BLUE DIAMOND OVEN ROASTED ALMONDS: As my acupuncturist has been telling me for months, protein is important for energy! Almonds are a great source of protein. They’re also crunchy and fun to munch on while watching episodes of Mad Men on your phone. I don’t know about you but I get crazy munchies while flying. HEALTHY QUINOA SALAD: I need a proper meal when I’m traveling otherwise all of the snacks in the world are no good to me. I also need one that’s not super heavy, that provides some good nutrition, that holds up out of the fridge and still tastes amazing. Recipe for this one after the jump! DRIED APRICOTS: I like to alternate bites of apricot and almonds. I think that’s reason enough to pack a handful! HUMMUS AND VEGGIES: Celery is hydrating, carrots are packed with Vitamin C and hummus is a protein powerhouse. They’re all three tasty and healthy. And that bento box is a lifesaver! DRIED MANGO: Maybe it’s boredom, maybe it’s the brain energy I expel creating elaborate fantasies (in my head) about my fellow passengers and their destinations. I don’t know, I just know I want to eat a lot of things that are yummy. And mango slices are such a treat! RELAX TEA: Crying babies are stressful (no offense crying babies, I know you’re stuck on a plane with plenty of reason to be upset about it! ), cold airplanes are uncomfortable, dehydration is terrible. Relax tea makes all three of those things a little better. APPLE GRANOLA: This will serve as a morning snack, one that I can draw out for a looonnnnggg time. Helpful when I’m waiting to board! This post was produced in partnership with Blue Diamond Almonds, all thoughts and opinions are my own! Rinse and cut tomatoes length wise. Place tomatoes on baking sheet and roast for 30 minutes. In a large mixing bowl combine tomatoes, quinoa, cucumber, kalamata olives and chimichurri. 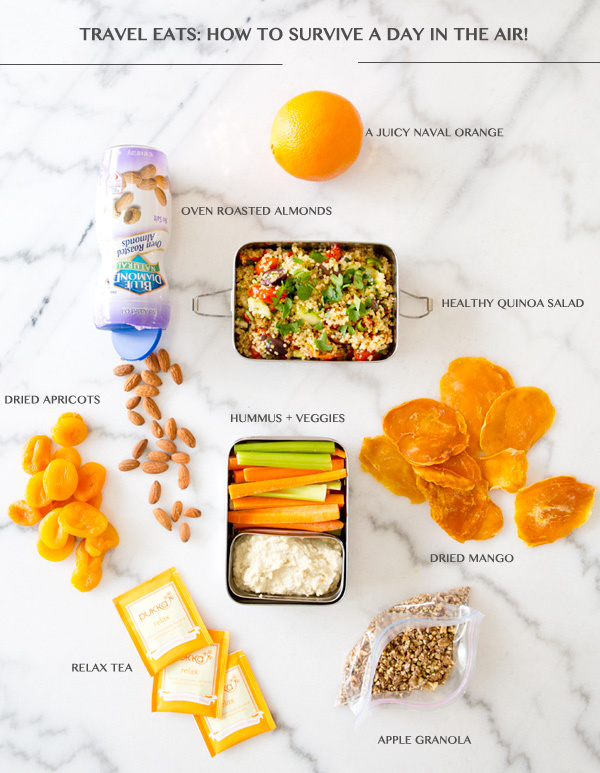 Love these suggestions for in flight snacks! I’m constantly traveling for work and have such a hard time staying healthy in the air! Excited to make your quinoa salad in preparation for my work trip to Nashville this week! what a great roundup of travel food. i’m going on a 6.5 hour bus trip to boston next week, so i’m trying to figure out what food to bring, as well. this definitely helps! are you planning on doing a post about your experience with an acupuncturist and adding more nuts and seeds to your diet? This post is so perfectly timed! I leave for France on Sunday and was freaking out about what I’m going to eat during my 13 hour journey. Thanks for the great ideas! Love this Sarah, as I’m trying to eat as healthy as possible. Great inspiration to do so! Happy travels. Love this! I’m not travelling soon, but this is so great to read for inspiration and daydreaming about my next trip. Those Bento boxes are adorable! Sarah, you can get food through airport security? I didn’t know that! I love this. I do this too, and totally get the alternating apricots an almonds. I do the same with another yummy combo, cranberries and cashews 🙂 I love this on my outbound, but often wish i had more of the same on my return trip! when staying in hotels and on the road it’s hard to do upon the return. instead all i have is an empty bento box. have fun in NYC!! my home away from home. I love this list. I recently took a trip to South America and took a huge salad, almonds and dried fruit on my long haul flights. And a bunch of hard boiled eggs (oh well! )- I do not do well with the dairy free plane food options and this literally saved my day. Oh, South America! I bet that was an amazing trip!!! I want tropical fruit mix! I stopped packing trail mixes because I would eat ridiculous amounts and get off the plane feeling bad about myself (really, ridiculous amounts!). HA! Love this! such a good idea. This is great! I’m flying out in the am. Thanks for sharing. This is awesome, you pretty much packed a bento! Airport food is so dreary and overpriced; I’m definitely on board with taking preemptive measures! Oh how fun! Your bento box is so cute! Hangry…it can be an ugly thing. Love this post Sarah! I’m going to Tokyo soon and it’s al loooong flight and I’m not really a fan of plane food (but then again, who is haha) so this post is a lifesaver! Also, I literally laughed out loud where you wrote that you drank a lake – glad I’m not the only one! Oh Millie, you’re going to have the best time in Tokyo!! And I’m happy to hear you’re drinking a lake on your trips to- I swear it makes ALL the difference! Ah, I wish I had these on my flight to Jordan! That quinoa salad looks so delicious. Thanks Wendy! I have traveled with it often without any problem, but it’s good to know there is that risk! Hi! What sort of bento box is that? Am looking for a good one for steel cut oats- do you recommend/think it would work for that? Thanks!! I often pack several single serving pacs of hummus and nut butters in the bag with my liquids and have never had a problem. 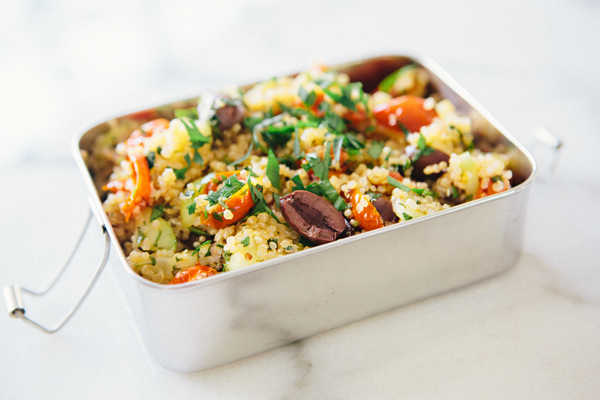 I just made this quinoa salad last night, and am eating it again for lunch right now. IT IS SO GOOD! I love the fresh flavors and I can only imagine how great this would taste on a plain among all the terrible airport choices. I will absolutely make this for my work trip in two weeks! Thanks for the suggestion!